Burglars may break glass in the unoccupied home. Should this be a concern firstly insert the three locks recommended below and then install a Retractable Security Grill (above). Break the glass (breaking of glass is more likely when key is left in the door and is visible from outside). NOW BY FOLLOWING OUR SOLUTIONS BELOW YOU GIVE YOURSELF THE BEST CHANCE OF PREVENTING BREAK-IN THROUGH THIS DOOR. 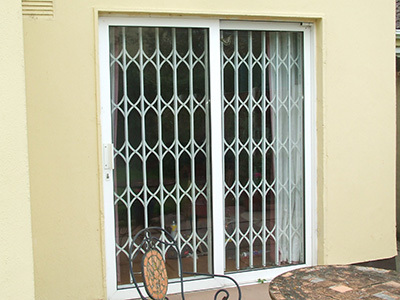 The eurocylinder lock is the first thing to replace with a high-security type and then you need to consider additional reinforcement for both the side and the bottom of the door. Price €29.00. Postage €4.00 extra. 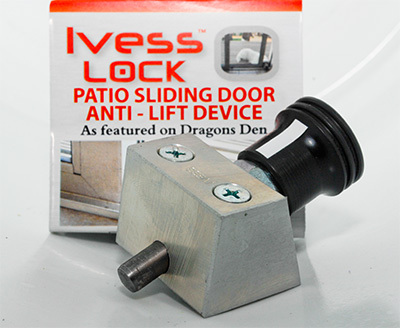 The Anti-Lift Latch Lock is as easy to install as 1-2-3. This lock is simple to operate and has an easy to use knob that makes it is easy to lock and unlock. 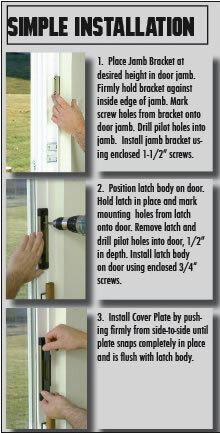 It is also easy to install and provides security to the bottom of the door. There are 2 screws provided in the pack and the backing card in the pack doubles up as an installation template. Keys are not required to open or lock either of these locks and so in the event of emergency both doors can be opened quickly to ensure a speedy exit. Now that both the side and the bottom of the door are secured, the door is no longer vulnerable to being lifted up or pulled out of position. This combination of two excellent locks offers the most economic and affective way of providing a double defence against break-in. Entry is best prevented by installing two locks - the Zentry Safe Slider Double Bolt Anti-Lift Latch Lock on the side of the door above your existing eurocylinder lock and by inserting the Ivess lock on the floor.